I have a three bay, rigid, plane frame that I am analyzing for a rolling 50 kip vertical load. The frame has pin connections at the base. I am trying to figure out how to analyze the three bay frame by hand, but have found very little technical literature on analyzing multi-bay frames other than by approximate analysis. I would like to use the slope-deflection method by splitting up the three bay frame into three simple, single bay frames. Can I separate each bay into its own single bay plane frame, and then superimpose loads similar to the approximate analysis methodology? I realize that I can model this very quickly in STAAD, but I am a new engineer and would like to understand and completely grasp how to perform this analysis by hand before modeling with software. If instead I used a braced frame system with inverted chevron bracing, would I analyze as a truss system with pin connections, and then analyze with the force method for indeterminate trusses since I would have four external pin connections at the base? I have attached a simple sketch to help visualize the frame. 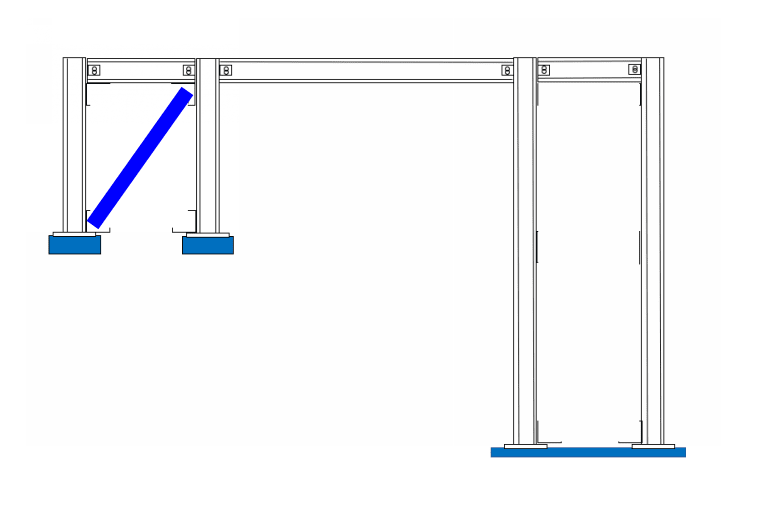 would MDM help, to analyze the horizontal member (a beam on several supports) ? It looks like all the joints (including the frame legs at the ground) are moment connections ? Maybe use unit force ? Consider the end bay as a standard portal frame with some moment "leaking out" into the continuous horizontal beam. Then the flip-side of this is the portal frame being loaded by this moment, say 1000ft.lbs. And the same is happening at the other end bay (just opposite). Or maybe this is the slope /deflection you were thinking of ... solve the end bay, how much does the RH joint rotate, calc moment to resist this, and iterate ? If you look at the horizontal beam, it has 4 force reactions and 4 moments ... that's a lot of redundancy (6). Two bays would be redundant to 4 dof, and much easier to solve. another day in paradise, or is paradise one day closer ? Just a word of caution on moment frames w/ pinned bases......you may get excessive lateral drift in your frame. I'd fix at least one of the bases. I am a big fan of the portal method. It is super simple and gives reasonably accurate results. It assumes an inflection point in the middle of all beams and columns. 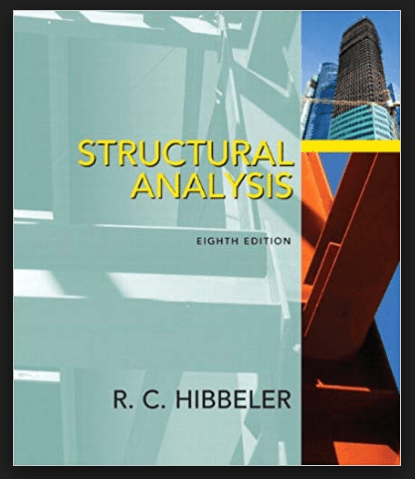 Look in almost any structural analysis text or try Google. The moment distribution method is a good method to get accurate results for indeterminate frames. I don't believe the portal method would work for a rolling gravity point load as the inflection point would depend on the location of the load. Can I separate each bay into its own single bay plane frame, and then superimpose loads similar to the approximate analysis methodology? I don't think so. Would the two, unloaded bays, not simply produce no results? Or are you planning to look at each bay individually as though it did carry the 50 kip? Either way, I'm not feeling the superposition thing. I like moment distribution for this as others have mentioned. For the design of the beam alone, I think that it would be pretty reasonable to just replace the columns with pin/rollers at the points along the beam where the columns tie in. If you wished to extend this, you could then assign the rotations at the tops of the columns to match the slope of the beam at the corresponding locations. This would give you design moments for the columns. All this would likely be as much effort as moment distribution (if not more) and would be less accurate. Thanks all for your replies and suggestions. It looks like I need to learn the moment distribution method, and then apply it to the frame. If instead I used an inverted chevron braced frame, what method would you suggest to determine the base reactions and axial forces? I assume I could analyze as a truss, but I read that you cannot the slope-deflection method or moment distribution to trusses, as there are no member moments. With all base connections pinned, I would have 8 unknown reactions and only 3 equations of equilibrium. I have used the force method for statically indeterminate, 1 degree trusses, but not for 5 degrees indeterminacy. Any suggestions? For Chevron, do a method of joints for the axial forces. Then use something like slope deflection or moment distribution to analyze to top member as a continuous beam, treating the Chevron joints as points of vertical support. Will you be doing a separate analysis for frame lateral loads? there's a difference between trusses with pinned joints and trusses with fixed joints. if 2 then statically determinate, if 3 then singly redundant (the horizontal beam that is), etc. Its easy to solve one redundancy by hand, unit force method is my preference, 3 moment equation would also be easy to apply. Thanks Celt83, that is a great link that I have referenced in the past. KootK - I have attached a sketch of the braced frame option. I opted to use inverted chevron bracing to avoid having the lateral braces take a substantial amount of load when the load location is at the beam mid-span, where the bracing would coincide. In the analysis, I placed the 50 kip load at the beam mid-span to design the beam. To design the column and lateral bracing, I placed the 50 kip load directly above one column and then applied a 2 kip lateral load to cover wind and rolling effects. This should give me the worst case loading for each element. I analyzed each "bay" by first finding the external reactions at the base using the force method, and then used the method of joints for the member forces. This seemed simple and straightforward enough, but I was curious as to whether I could isolate each bay in the analysis like I did, or if I had to look at the global structure as a whole to get more accurate results. Thank you rb1957 for your reply. I agree, unit force method would be my preference also. The braced frame option seemed more straightforward to design, as the lateral load path was in the form of the lateral braces. I was looking into designing a moment frame to ease construction by not having to erect so much bracing, but the lateral load path wasn't as straight forward when using a moment resisting, three bay frame. This lead me to think that maybe I could separate each bay and apply the slope-deflection method, but after hearing all responses it seems like mdm is the way to go. - Obviously, I don't know all of the constraints here but, at first blush, you seem rather over-braced. See my suggestion below. - I think that a good strategy here would be for you to employ whatever approximate methods make sense to you and then compare those results to FEM output. why not simplify the braced frames to a single diagonal ? My thought process behind bracing each end bay: I plan to install a pad-eye on top of each end column, and use that as a pull-point to move the load along the frame. Since I am going to have a pull-point at each end, I thought it would be a good idea to have lateral bracing at each end. Is lateral bracing in one bay sufficient for this scenario? The lateral load would travel to the location of the diagonal brace, so that does make sense to just have diagonal bracing in one bay. I was just being conservative since it is a temporary structure installed for a large, moving load. sure you can react the longitudinal load at both ends. Just more complicated, particularly given how different the ends are (the shorter one will be much stiffer than the long end). I can see the logic for making a mid-bay pick-up for the chevron. It's not really simple, but I have used a moment distribution for a frame in Excel and then automated it with a macro to get the reactions for various loading. So typically with a lateral force resisting system, you generally need at least one brace system within each plane of a frame. For example, if I was to design a low-rise, four sided square building, I would need at least one braced bay on each of the four sides for the lateral loads, and then some type of lateral bracing for the roof plane. A question I have now is when is it necessary to include more than one braced frame within a single plane? It would seem that the lateral load would generally travel along the first lateral brace it encounters along the load path, with very little leftover for a different braced bay within the same plane. I don't deal a lot with drift limits, since most of my steel structures are just platforms or frames for moving loads, but it seems that multiple braced bays within the same plane of a frame are only provided to limit the inter-story drift. Is this a correct statement? That would make sense why the previous sketch appeared "over braced", because in reality, only one lateral brace system is needed per plane, assuming drift is acceptable. A question I have now is when is it necessary to include more than one braced frame within a single plane? 1) Is there a need to spread lateral resisting strength to multiple locations? A single brace/footing can only take so much. 2) More importantly, considering P-delta effects, is there a need to spread stiffness along the framing line? At any location, the amount of lateral travel that you'll see in your gravity loads is a function of braced frame drift, elongation in the drag strut, and any slip in your connections. Those add up over long framing lines unbroken by intermittent bracing. Back before computers, and shoddily trained junior engineers, there was an informal rule of thumb that every fourth framing bay ought to be braced. And don't think that I'm calling you a shoddily trained junior engineer. You may in fact be that but, so far, I've seen no evidence of it. You're here taking the time to ask the right questions which is absolutely everything. Assuming the one brace is adequate to resist the full lateral load applied to the frame, and the beams and connections are adequate to transfer the load from the point of introduction to the braced node, then a single brace should be sufficient. IOW, follow the load path and check each member and connection along the way. If you have more than one brace, the load will theoretically be distributed based on the relative stiffness of the sum of the components between where the load is introduced and the endpoints of the load path (bottoms of the braces). KootK, I will agree with your statement that I am a "shoddily trained junior engineer". Most of what I have learned has been from reading a textbook. I have had very little mentorship since graduating, and unfortunately, will not have any structural engineering mentorship for the perceivable future. Since we have structural analysis software, it isn't seen as a problem. It sounds like I just need more practice with indeterminate structural analysis techniques. I never learned moment-distribution method, matrix analysis, or any numerical methods of analysis while in undergrad. It seems like that would be a good starting point for now. Thanks HotRod10 for your input as well. and unfortunately, will not have any structural engineering mentorship for the perceivable future. Get that mentorship here. That possibility is one, very fine, aspect of the internet age. There frankly isn't a design office on the planet that can offer the same quantity and calibre of willing mentorship that you can find right here. We'll fight among our ridiculous selves to be the first in line to help you out. With regard to your analysis method deficiency, consider the text below. It's an easy read and will get you up to speed in a hurry. they have a few typos here and there but they convey the concepts decent enough. I found I personally learned and retained more trying to create excel spreadsheets for somethings as it forced me to really make sure I understood something to be able to make a generalized calculation spreadsheet rather than just looking up a formula and plugging and chugging. We'll fight among our ridiculous selves to be the first in line to help you out. KootK - Thanks for the reference to Hibbeler's text. I applied the truss analysis using the stiffness method on the single diagonal braced frame sketch you included within a previous post. By inspection, I know that the vertical member framing into the bottom left support is a zero-force member if only a lateral load is present at the joint it frames into above. Therefore, the horizontal reaction at the support should equal the vertical reaction if the bay length and height dimensions are the same. In the analysis, I used a 5' wide x 5' tall bay, so the vertical and horizontal reaction should be equal. Since they are not, the truss appears unstable. The truss has 8 bars, 5 support reactions, and 8 joints, then b+r=13 and 2j=16, therefore it is unstable. With all this being true, how do I go about analyzing the frame? I can added bracing to the right-most bay, but I cannot add bracing to the middle bay due to interferences, and therefore it would appear the truss would always be unstable due to the middle bay. Do you have any recommendations on how to approach this problem? Is analyzing the frame as a truss not the correct approach? In my mind it should be stable, since braced frames in buildings are constructed in this manner and they have no stability issues. when you say "therefore it is unstable" do you mean that it is statically indeterminate (or redundant) ? the horizontal member is indeterminate, but MDM (or many others) can resolve this. the frame is determinate for horizontal load (since there is only one loadpath). I think all this says that you should not consider this as a truss (with axial members only) since there should be an amount of bending in a frame. The horizontal member is definitely a beam. I am so glad that there is this forum for me to learn. I am only a junior engineer and never licensed. I have about two years of experience. I do not have a mentor. I have to learn on my own after graduation. I only have an senior engineer for three months when I was an EIT. I am a civil and structural graduate. I am more an architectural and structural designer for small buildings. I think we analysis a port frame of 4 bays using the portal method or the cantilever method. Tall Building Structures, analysis and design by Byran Stafford Smith and Alex Coull has a very good worked out example. For the port frame of 4 bays, the axial forces of the interior columns are assumed to be zero, leaving the column on the windward side in tension while the column on the leeward side in compression. For the cantilever method, the building is assumed to be a deflected cantilever from ground up. However, the Tall Building Structures only has a three bays worked out example for the cantilever method. The portal method is good up to 25 stories with a height to width ratio not great than 4:1. The cantilever method is good up to 35 stories with a height to width ratio of 5:1. I could not find any information on chevron trusses except the Seismic Design Manual by the American Instittute of Steel Construction and the Structural Steel Educational Council. I still feel fuzz in following the worked out examples on the book, so I am only quoting what the book says. But i am not going to design anything falling out of The Canadian Building Codes Part Nine and The American International Building Codes for Residential houses and three storey apartment. disclaimer: all calculations and comments must be checked by senior engineers before they are taken to be acceptable. The truss has 8 bars, 5 support reactions, and 8 joints, then b+r=13 and 2j=16, therefore it is unstable. I count eight support reactions, horizontal and vertical at all four base plates. That help any? Is analyzing the frame as a truss not the correct approach? This should work just fine so long as you're applying nodal forces. "I count eight support reactions, horizontal and vertical at all four base plates." ... assuming the uprights carry transverse load (ie in bending, ie not as a axial truss element). 5 support reactions = 4 vertical and 1 lateral, which is what we were trying to achieve with the diagonal member (to react the lateral loads). "nodal loads" I think means loads above the supports, which is a pretty trivial solution (all the vertical load would be reacted by the one vertical element). More general vertical loads (ie between support nodes) requires the horizontal member to react as a beam (on many supports). But that may have been your point ? I disagree and stand by my original numbers. Eight support reactions are available even if some will have zero magnitude. Moreover, ignoring those zero load restraints would lead to instability were one looking at this with FEM software etc. I thought that this might be entering into OP's assessment of instability. Obviously, when working by hand, a confident structural engineer can simplify the problem to not include consideration of the zero force restraints. My point was really that a truss model is suitable for nodally applied loads and generally unsuitable for loads applied directly to members. That's all. I'm not entirely certain at this point but, given that much of the discussion here revolves around the bracing, the nodal load of interest would be a lateral load. I'll leave it to OP to correct that assumption if necessary.